Common, among those Protestants who tend to accept the literal understanding of the Bible and have interest in matters prophetic, is the belief that before Jesus returns there will be a new (or rebuilt) temple in Jerusalem. That there will be a third temple is predicted by the prophet Daniel, the apostles Paul and John, and none other than Jesus Himself. They all taught that Israel’s third temple will be rebuilt either before the Tribulation begins or soon thereafter, for it is seen in complete operation by the middle of the Tribulation. Obviously, since Israel does not now have a temple, a third temple must be rebuilt for such an event to occur. …the Antichrist desolates it near the middle of the Tribulation. (Are We Living in the End Times? Tyndale House, Wheaton (IL), 1999, pp.122, 126). But this contention that there needs to be a third Jewish temple in Jerusalem is wrong. The New Testament itself basically uses two Greek terms for temple: they are hieron (ίερόν) and naos (ναος or ναον). While the Greek term hieron always refers to a physical temple in the New Testament (usually a Jewish one, but sometimes a pagan one, e.g. Acts 19:27), the term naos does not have to (and often does not, e.g. John 2:19-21)–and the naos temple is what Jesus, Paul, and John were referring to (Daniel did not use any accepted Hebrew term for temple in his prophetic writings). Many Jewish Scholars Claim a Temple is Necessary, But Does the Bible? 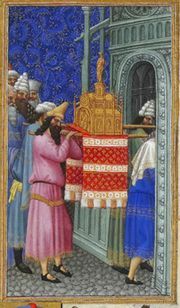 While most contemporary Jewish scholars seem to contend that a physical Jewish temple (Hebrew: בית המקדש, Bet HaMikdash; “The Holy House”) is necessary for the resumption of sacrifices, this appears to be based more upon certain Jewish traditions than the Bible. Jesus, however, specifically warned against taking the traditions of Jewish religious teachers above those of the Bible (Mark 7:13). The Bible itself never teaches that animal sacrifices cannot be performed unless there is a temple in Jerusalem. Until Solomon built the first temple (1 Kings 6:14), the Bible shows that the Jews sacrificed on altars. David, Solomon’s father, for example sacrificed on an altar (2 Samuel 24:25), as did Aaron and his descendants (Exodus 20:24; Leviticus 1:10-11). And prior to all of that, Abel (Genesis 4:4), Noah (Genesis 8:20), Abraham (Genesis 22:9-13), and others sacrificed animals to God. So for over 3,000 years, animal sacrifices were offered without a Jewish temple. One may argue that since it takes Jewish religious leaders in order for Jewish animal sacrifices to be resumed, that the above scripture is a mute point. And it might be if there were no Jewish religious leaders that thought that they could not sacrifice without a temple. But the fact is, that although they are in the minority, there are significant numbers of Jewish religious leaders who are intent on starting animal sacrifices as soon as possible. And these Jewish leaders do not believe that they have to wait in order for a temple to rebuilt in order to do so. The “Sanhedrin” group referred to above began to form in 2004 and claims to have “the consent of hundreds of rabbis, scholars and leaders” (http://www.thesanhedrin.org/en/index.php/The_Sanhedrin_Initiative viewed 09/11/08). It also has been working on implements, including those related to having an altar. This group has made some attempts to offer sacrifices in the past, but has often ran into political opposition. Yet, because the Muslims have a strong presence at the site of the old Temple Mount (Har HaBayit) with their al-Aqsa Mosque, some consider the actual construction of a Jewish temple there to be impossible. However, in a nation as politically fragmented as modern Israel, the time may come when a ruling coalition will have in it some members of a small religious group that will insist on the resumption of sacrifices for it to be able to remain in office. And allowing sacrifices on a small altar certainly would seem politically more plausible than the construction of a Jewish temple on the dome of the rock or otherwise next to the al-Aqsa Mosque. While this may not be seen as viable in every possible Israeli administration, it certainly is a possibility for a future one. But be that as it may, the Bible itself allows for the resumption of animal sacrifices without a physical temple being rebuilt. Hence, from a biblical perspective, a rebuilt third Jewish temple is not required for the prophecies in Daniel (or any other part of the Bible) to be fulfilled. Biblically, all that is required are Jewish religious leaders willing to sacrifice in Israel. And there are enough of them currently to conclude that animal sacrifices can occur at almost anytime. For further clarification of the position of the reconstituted Sanhedrin, I contacted that group and asked why it felt that sacrifices can be started before a temple is rebuilt. טז [טו] מִי שֶׁשָּׁחַט קֳדָשִׁים בַּזְּמָן הַזֶּה, וְהֶעֱלָה חוּץ לָעֲזָרָה–חַיָּב: מִפְּנֵי שְׁהוּא רָאוּי לִקָּרֵב בִּפְנִים–שֶׁהֲרֵי מֻתָּר לְהַקְרִיב, אַף עַל פִּי שְׁאֵין בַּיִת, שֶׁקְּדֻשָּׁה רִאשׁוֹנָה קִדְּשָׁה לְשָׁעָתָהּ וְקִדְּשָׁה לָעֲתִיד לָבוֹא, כְּמוֹ שֶׁבֵּאַרְנוּ. יז [טז] הַשּׁוֹחֵט קָדְשֵׁי גּוֹיִים בַּחוּץ, חַיָּב; וְכֵן הַמַּעֲלֶה אוֹתָן בַּחוּץ. וְהַגּוֹיִים מֻתָּרִין לְהַקְרִיב עוֹלוֹת לַה’, בְּכָל מָקוֹם–וְהוּא, שֶׁיַּקְרִיבוּ בַּבָּמָה שֶׁיִּבְנוּ. וְאָסוּר לְסַיְּעָן, וְלַעֲשׂוֹת שְׁלִיחוּתָן–שֶׁהֲרֵי נֶאֱסַר עָלֵינוּ לְהַקְרִיב בַּחוּץ; וּמֻתָּר לְהוֹרוֹת לָהֶם, וּלְלַמְּדָם הֵיאַךְ יַקְרִיבוּ לְשֵׁם הָאֵל בָּרוּךְ הוּא. Additionally, it is worth noting that on 5766, Rabbi Benyamin Fuss published a 445 page book on Sacrifices of non-jews, of which the text proper is of 372 pages [the rest are indices, etc.] called Torat Habamah: Regarding sacrifices on an Altar outside the Temple. (In email from the Sanhedrin webmaster Abrahamson to Bob Thiel September 17, 2008). The nascent Sanhedrin sees itself as the continuation of rabbinic jurisprudence, and must take into account all halachic works written to date, and proceed from there. http://www.thesanhedrin.net/en (Email from the Sanhedrin webmaster Abrahamson to Bob Thiel September 17, 2008). Thus, the position of the nascent Sanhedrin appears to be that Jewish sacrifices can be started on an altar and that a physical temple is not required. This is certainly consistent with past biblical practices, as well as the teachings of the Living Church of God. And contrary to the implied assertions of Dr. LaHaye and J. Jenkins who think sacrifices must be in a Jewish temple. A third temple of Jerusalem being built was never specified by Jesus, Daniel, Paul, nor John. There is simply no verse in the entire Bible that states that a third temple in Jerusalem needs to be built before the Antichrist’s final 3 1/2 years. Errors in prophetic understandings, like those that Dr. LaHaye and J. Jenkins have been promoting (they also wrote the Left Behind series of misleading books), will likely result in many not understanding the fulfillment of certain prophetic events. Why is a Jewish Temple in Jerusalem Not Required? Although people like Timothy LaHaye teach a third Jewish temple is required, who is ‘the temple of God” in the New Testament? This new article goes over , in much more detail, the biblical reasons why a a third Jewish temple in Jerusalem is not necessary. This entry was posted on Thursday, September 18th, 2008 at 6:27 am	and is filed under Doctrine, Old Testament History.